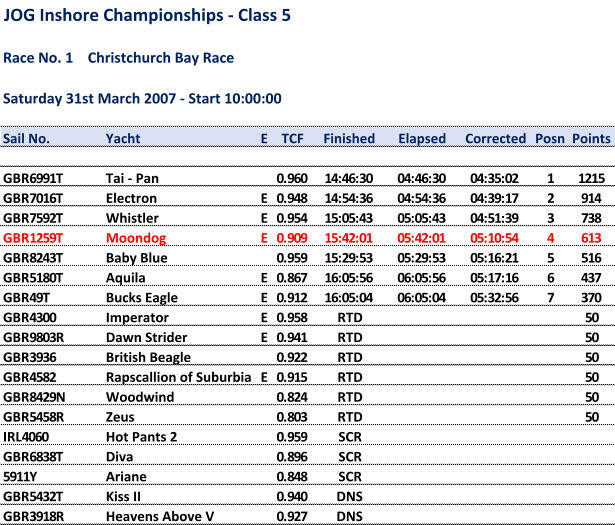 For our first race on a different boat to last year 25 to 35 knots over the deck was not our ideal conditions. The new Moondog (Ex Lazy Bear) should suit us well and we look forward to some better results once the winds lighten a bit. Main memories of the race were a good start level with Aquila in the front row over the line. Two sail reaching off the line proved very enjoyable as we appeared to be leaving the fleet. Then the first 31.7s all went for kites so we did as well however as this was our first ever spinnaker hoist on the new boat we went for the chicken chute which did end up a little conservative for the condition as the wind appeared to drop as the leg to Yarmouth progressed and the 31.7s went by and slowly crept away. Turning into the wind showed how vulnerable we are to a strong wind beat into a strong tide only two up, the tacking angles were appalling and VMG very low. We persevered with one reef and #3 up the first beat and dropped down to 2 reefs for the second. The beat back to the finish was spent concentrating on the depth sounder readings with numerous rapid tacks as the reading suddenly shot down to 2 metre and sometimes less. Sincere apologies to British Beagle as she may have been tracking us into Gurnard Bay, we passed about 50 metres inside the buoy heading into the Bay and had travelled 100 to 200 metres when suddenly the depth shot down to 2.5 and by the time we had crashed tacked were in 1.9, Definitely too close for comfort on the end of the ledge, we survived. Looking back at British Beagle we were horrified to see her come to a dead halt on the end of the ledge with the stern rising visibly high out of the water. She soon retired and we hope no severe damage was done to either crew or boat. We finished around 15:45 and assumed a poor result due to the amount of time spent beating poorly into the wind and tide however, were pleased to be fourth and are looking forward to improvements in future races. Many thanks to the race committee for not sending us round SW Shingles, that could have been fun!